Outside my window... the ice has melted!! I ended up being very worried this past weekend that I would go into labor since our driveway, and whole yard, was a sheet of ice... Not to mention all the roads leading to the hospital, which is a 40 minute drive with good weather and no traffic!! I am hearing... Piano Winterlude playing on our stereo and the children playing with our various Nativity play sets in the living room. It's so nice and peaceful for the moment! I am thinking... about how much easier cut-out cookies are to make with a nice heavy marble rolling pin ! Wow!! My friend Marci brought her rolling pin over when we baked cookies together for the feast of St. Nicholas and I had to order my own right away! Now I am really looking forward making more for Christmas! I am praying... for a safe delivery and healthy baby, preferably sooner than later! ;) It would be nice to be home to pray and celebrate the O Antiphons with my children! I am also praying for a dear friend that could use lots of prayers right now... Would you all mind offering up a Memorare for this special intention? From the kitchen... leftover Santa Lucia Bread from yesterdays feast day celebration. It is just as yummy as it looks! The girls also made Chocolate Covered Rice Krispie Peanut Butter Balls to save for Christmas. I'm hoping that we will be able to do a little more Christmas baking soon. From the learning rooms... now that we are officially on a break, I keep meaning to tidy up the room, but instead the table has been piled high with a number of things that need to be sorted through and given homes. Perhaps I can work on that today. Living the Liturgical Year at Home... Three candles have been lit on our Advent Wreath, our Advent Calendars and Jesse Tree are beginning to fill up, we've been reading lots of Advent and Christmas Picture Books, and on Thursday we will begin praying the O Antiphons! 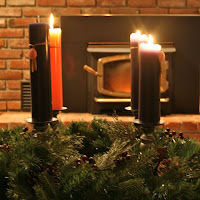 I just LOVE Advent!!! I am creating... wonderful Advent memories with my family! I am wearing... black leggings and a long grey sweater with a white tank underneath. With all the contractions I've been having, I have just not been able to wear my skirts for very long. I am going... to try and find just two more gifts for Christmas. My parents decided to have everyone over this year on Christmas Eve for a family gift exchange and so now Hubby & I each need to find a gift for the name we drew. (On a side note DrawNames.com is SUCH a great site to set up a gift exchange!) The grandchildren will also exchange gifts -- which is really easy since it is just my own children this year! I am reading... lots of picture books to my children. I also just received The Christmas Secret from Paperback Swap, the latest book from Donna VanLiere's Christmas Hope Series which began with The Christmas Shoes . I think I will pack it to take to the hospital with me. I am hoping... that this baby will turn. I've been trying a number of different things, but she seems to be pretty stubborn. Around the house... lots of hidden Christmas gifts, all wrapped and ready for Christmas. It has been so nice to have almost all of it taken care of before Advent began! One of my favorite things... new babies and ultrasound photos!! My brother and sister-in-law are at the doctors right now having an ultrasound of their first baby! I can hardly wait to hear if I'll be having another niece or nephew!! I am so excited for them! Ummmm... If it was up to me, I'd be having a baby... I guess we will see! I do have my next appointment late tomorrow afternoon. I'm very curious to see if I've made any more progress since last week. Other than that, I am also hoping that we can get our Christmas tree and do a bit more Christmas baking. It might not be a good idea to put it off much longer! 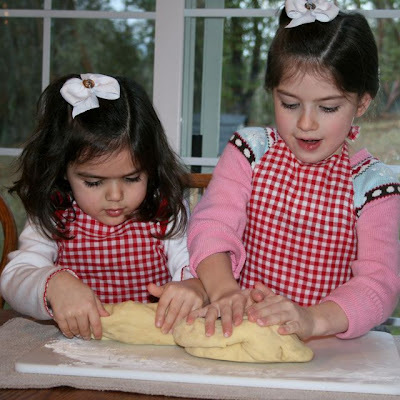 The girls kneading the dough for their Santa Lucia Bread. The St. Therese bows in their hair were a gift from Cecilia at Hair Bows for Life! Thank you so much Cecilia, we love them!! Glad the ice melted; that can be a scary obstacle to one who is in labor and needs to get to the hospital. Lovely post as always Jessica! The Lucia bread looks wonderful and the choco covered rice crispy pb balls sound super yummy! Baking with the kids is something that I have really missed this season. 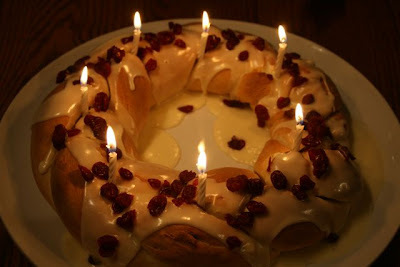 We also made Lucia bread but used a different recipe to last year as our children didn't like the one we used. I hope to have our St Lucia post up tonight. I love the Christmas Shoes and the next one whose name escapes me BUT I am such a wimp I cried during both of them. I would love to get the new one too. How exciting to have your Hubby home for so long. I am sure you will all enjoy that. I enjoyed my visit so much! What a beautiful family and I love how you are celebrating the season! Hope that baby arrives this week and that you have a restful Christmas at home!